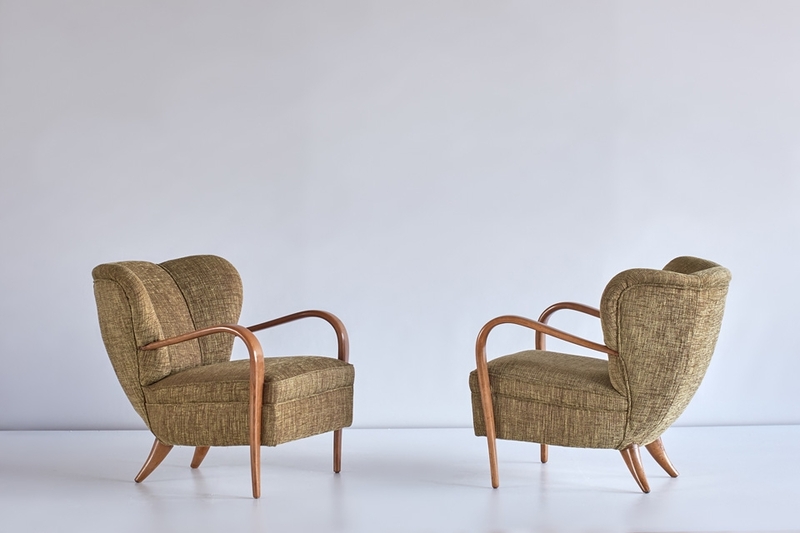 An important pair of 1940s armchairs designed by Silvio Cavatorta. These chairs were made by hand in the Cavatorta workplace in Rome, known for its meticulous artisanal production methods. The walnut arms of the chair bend around to form the chair’s front feet, while the curved back feet complete the elegant silhouette. Preserved in a very good condition, this pair offers a stunning example of Cavatorta’s craftsmanship and originality. The chairs have been newly upholstered in a green bouclé fabric. Biography: The family company Cavatorta was established in Rome in 1869 by Eugenio Cavatorta. It produced its furniture only in small and exclusive series, its main customers being embassies, hotels, schools and ships. Each furniture fitting was designed uniquely for each specific commission. During the 1930’s, led by Eugenio’s son Silvio, the company started to obtain prestigious commissions for international organizations and ministries. Silvio’s son Franco studied architecture during which he took extended internships in the studios of Le Corbusier, Arne Jacobsen, Finn Juhl and Sven Markelius. He was the first to present these northern modernist developments in Italy during a conference on Scandinavian furniture. During this time the Cavatorta’s continued to obtain big commissions, the most famous of which must have been the first class dining room of the Andrea Doria. While most other well-known and loved designers embraced the industrial methods of production and reproduction in the second part of the 20th century, the Cavatorta company remains truthful to its own standards in its rejection of large and industrial production in favor of fine material and craft. Due to these unique commissions, the family-company’s craft and material oriented style of production combined with a cosmopolitan interest stretching beyond Italian design, Cavatorta’s furniture remains unique, rare and of a very high quality, aesthetically as well as in its construction. Bibliography: Il mobile italiano degli anni 40-50, Irene De Guttry, page 137, fig. 5 / Mobili imbottiti, poltrone salotti e tessuti per l’arredamento, Cesare Saracchi, Gorlich Milan 1947.